One of my favorite things to do is set a table. I love mixing and matching and creating “art” on my table. A nicely set table can make a huge difference in a dining experience and I think how you set a table can affect how much your guests like your food! 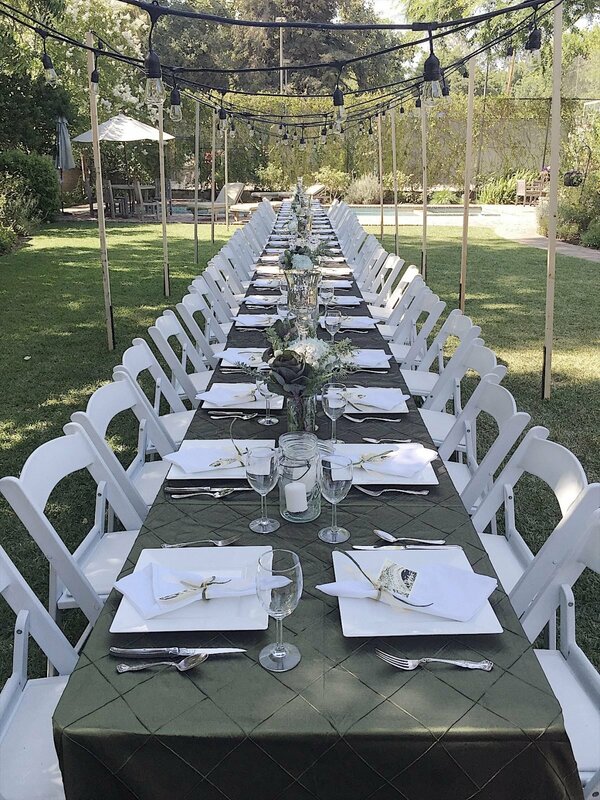 There are some common mistakes that are made when setting the table and today I am going to share what I think are the five most common mistakes setting a table. Good conversation at a table is important. So anything on the table that blocks the view for your guests to talk to each other should be left off the table. I set this table for a blog post, not a dinner party. Although it looks great in this photo there is no way I could set this table for an actual meal. The vases are way too tall and I think my guests would feel claustrophobic. 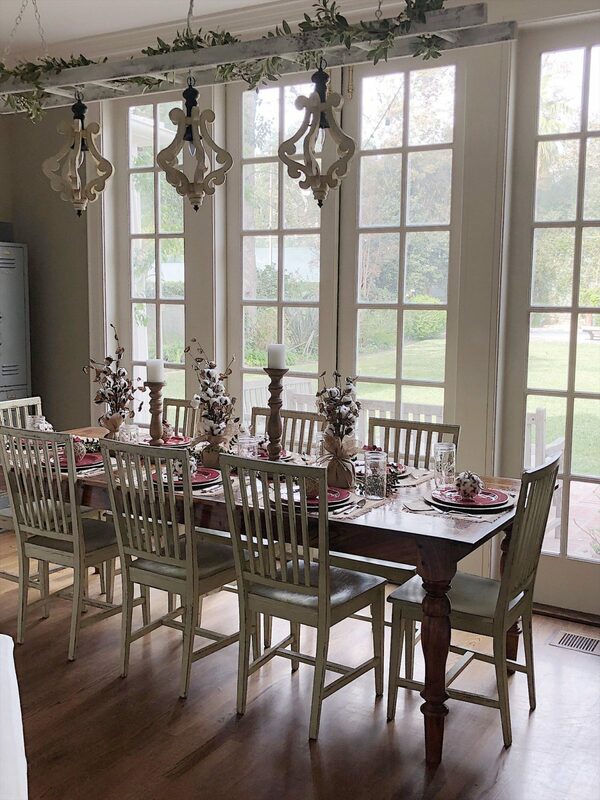 When I add my centerpieces I always sit in two or three chairs at the table to make sure the sight view is clear. I can’t even begin to tell you how many times I thought everything was good, only to sit down and realize my flowers were too tall. It’s also important to make sure your centerpieces or candles aren’t too fragrant. You don’t want the scents to interfere with your cuisine or make your guests uncomfortable. 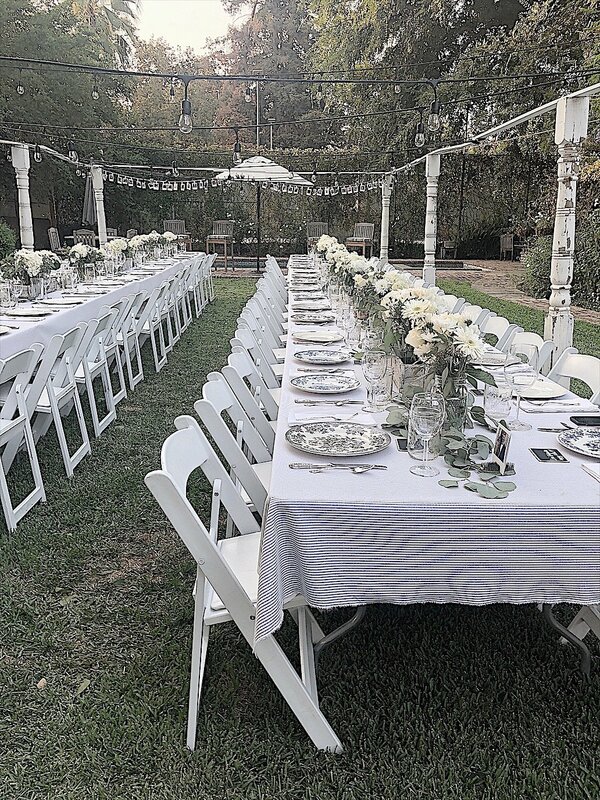 It’s fun to set a table with lots of silver, large napkins and lots of wine glasses. But the last thing you want is a crowded table. You can always change out your vases and make your centerpieces smaller to make more room at the table. Ideally, you should allow for a minimum of 24 inches per guest. If you have more then that is great. 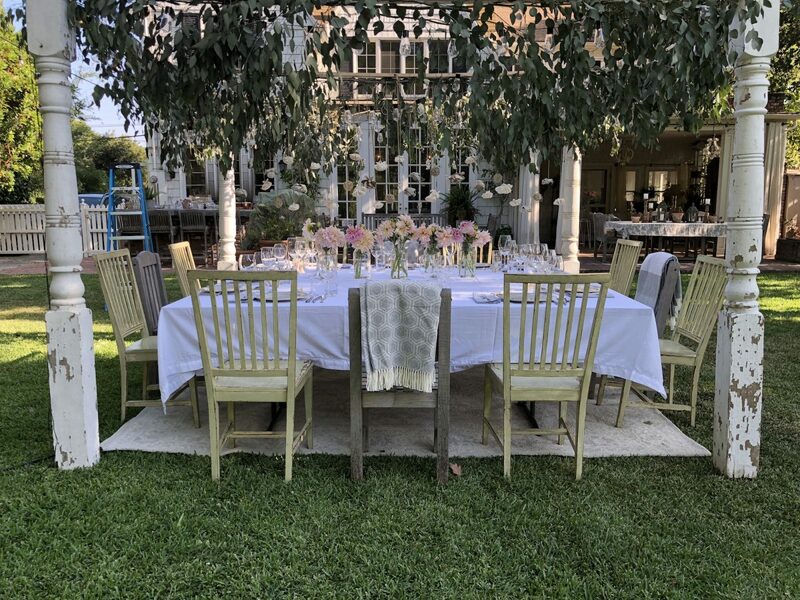 Don’t forget to use comfortable chairs and use place cards to arrange your guests in a way to encourage conversation. This summer I was on a mission to create some very unique settings for dinner parties. There is nothing like hosting a party and blowing your guests away as they head to the table. There is a certain energy that is created with a unique lighting, sound, and environment. This requires some thinking outside of the box but I promise you it is worth it. I created this table setting above for my son’s engagement party. When the sun went down, it was incredible! I can’t wait to set some tables this winter in front of the fireplace in our living room and I am super excited to host one outside under our back patio. I think I can close the curtains, light the fire and turn on the ceiling heaters and pull it off! 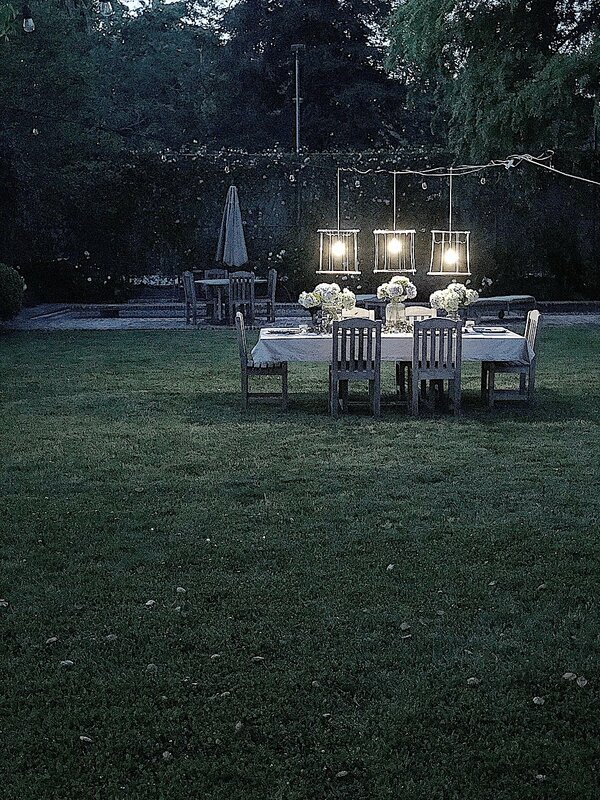 You can also just add some unique lighting to your table or hang some additional lighting above your table and create a great setting. Imagine how awesome a table would be with thirty candles lit on the table? 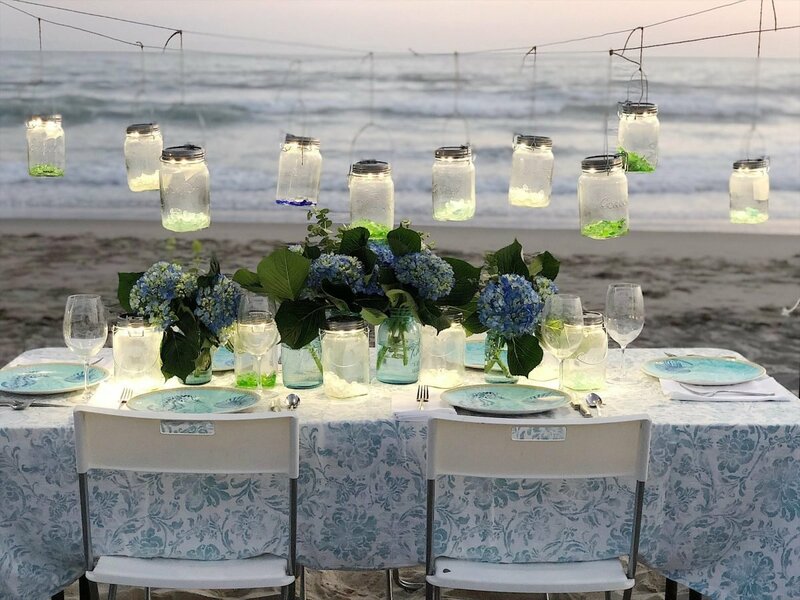 I love the table I set on the beach with my solar powered lanterns. They make a great lighting option. At the least, be sure to turn down the existing lights in the room. I added dimmer switches to all of our rooms when we first moved into our home. It’s so important for ambiance. Music is also really important. Don’t forget to make a playlist in advance and keep the music low. Be sure to keep items you may need during dinner nearby. Items like salt and pepper, wine, water and sauces served with the meal should be on or near your table. If the extra wine and water don’t fit on the table have them very close by. A lot of guests won’t ask for them if they aren’t in plain sight. So be sure to think ahead of what they may need. 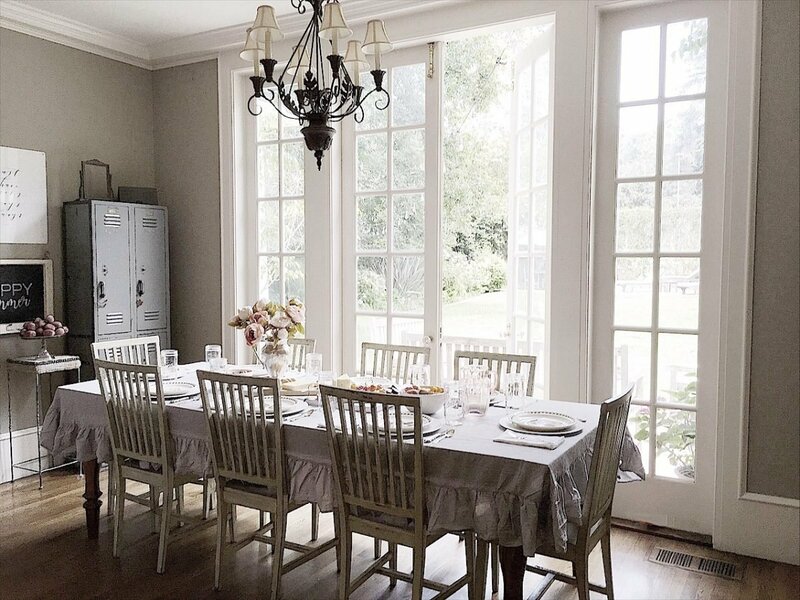 That’s why a buffet is so great to have near all of your dining tables so you aren’t having to get up throughout dinner to keep your guests happy. I know it is really fun to set a pretty table with your silver but don’t set utensils that you don’t need. If you are setting a salad fork with the intention of using it for dessert it is likely it will get used during dinner. Keep things simple whenever you can. 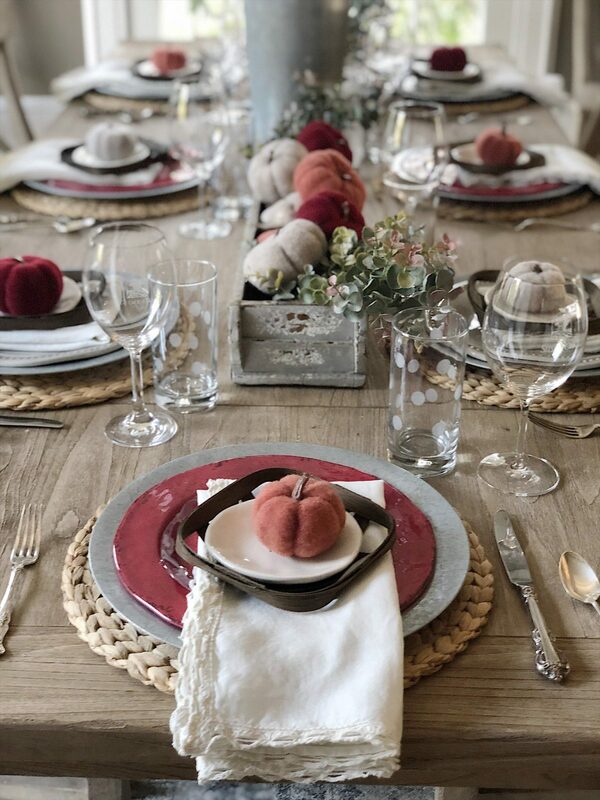 If you can avoid these five common mistakes to set a table then you will be amazed at how much more you will enjoy your dinner party. One of the most common questions asked when setting a table is, what is the correct way to set a table? There are a few basic things you need to know and it’s easy from there. The forks always go to the left of the plate and the knives and spoons go to the left. Napkins also go on the left. All of the additional utensils are set in the order of use, from the outside in. Since you use a salad fork before a dinner fork, the salad fork goes to the outside. There are a few hints you can use to remember hot to set a table. Use the word F-O-R-K-S. Going left to right, F is for the fork, O is for the round plate, ignore the R, K is for knife and S is for the spoon. You can also use b and d. Touch the tip of your thumb to your pointing finger. You should form a lower case b with the left hand and a lower case d with the right hand. That can be a reminder that the bread plate goes on the left side and the dessert plate goes on the right side. I hope you have as much fun as I do setting your next table. If you have any additional tips I would love you to share them here! When you preset your table and have centerpieces that take up so much room, do you serve buffet style and people go get their plate from the table before going through the buffet line? Or do you pass the food dishes around the table? If so, where do you put the food when not being passed?? Love all of this! I was taught at an early age how to set a proper table. The rhyme my mother taught me about utensil placement: The knife and fork got in a fight and the fork left. Love this Leslie. Enjoy your sense of style. And the photography. Simply beautiful!!! 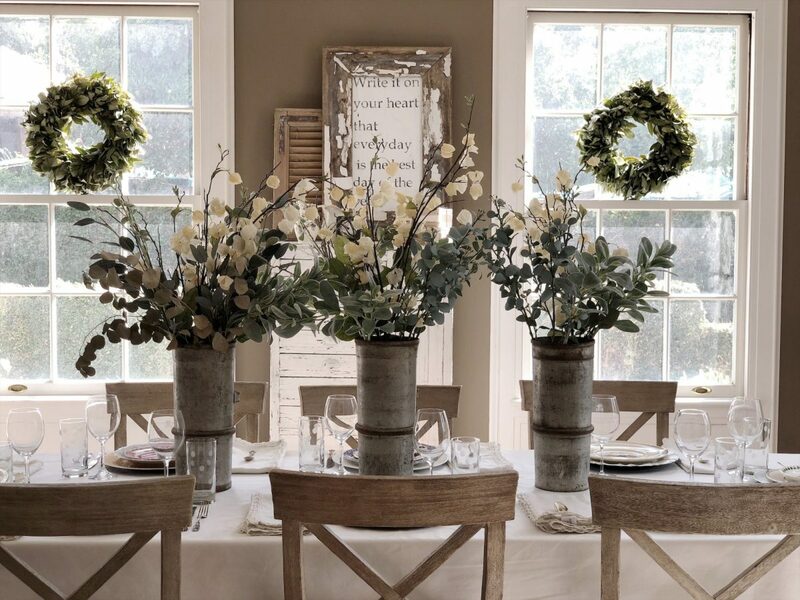 Great tips, especially about center pieces! Been there, done that with looking around them & ultimately removing to see company – Thank you. Also I believe you meant the knives and spoons go to the right of the plate. Fabulous tips Leslie, so spot on!